The only “source” for these allegations is an AP photo with a much blander caption, but that’s just what you’d expect from the anti-Paul media, right? 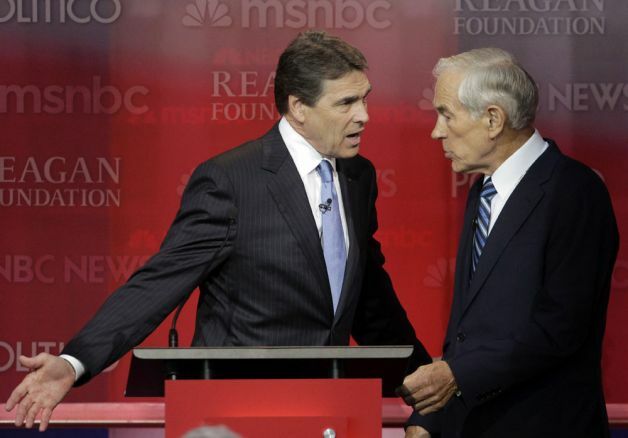 During a commercial break at Wednesday’s Republican debate, Rick Perry and Ron Paul continued their spirited exchange on stage. 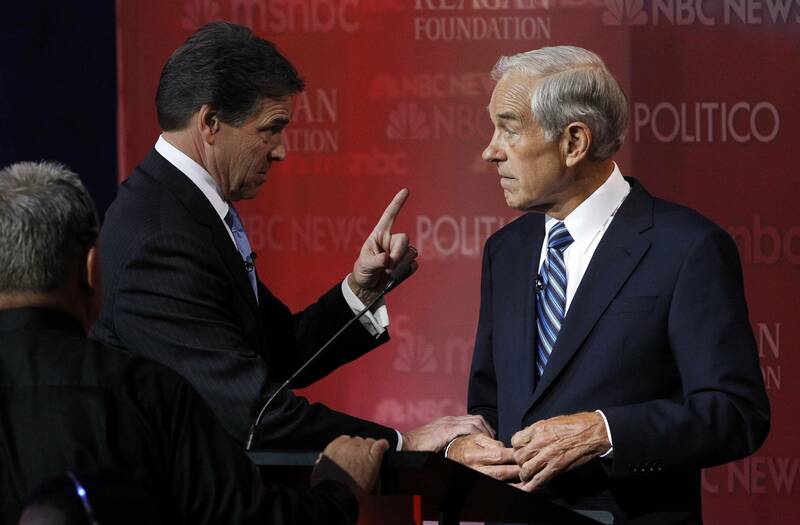 Suddenly, Perry grabbed Ron Paul’s forearm while aggressively pointing his index finger towards the Congressman’s face. Alerted by Perry’s menacing gestures, Ron Paul’s bodyguard (front left) was standing by, ready to protect the Congressman. Republican presidential candidates Rick Perry, left, and Rep. Ron Paul, R-Texas, talk during a break at a Republican presidential candidates debate at the Reagan Library Wednesday, Sept. 7, 2011, in Simi Valley, Calif.
There’s also a second photo in the mix, which carries the same caption, apparently taken shortly after the first. Did Perry “menace” Paul off of his podium, or did he just really need a Tic Tac? Only Ron Paul knows for sure. 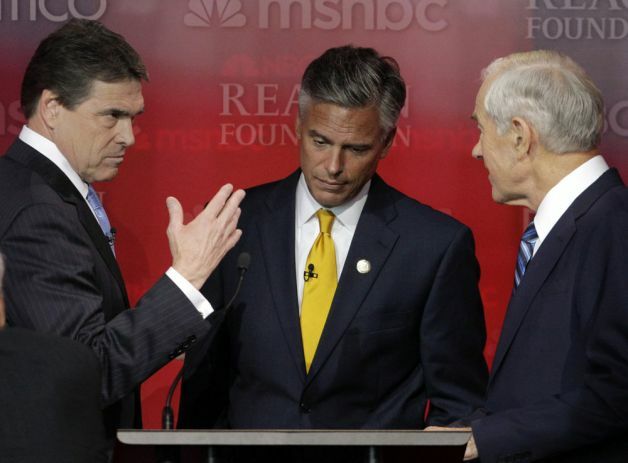 Were they each trying to convince Huntsman to be their “second” in a pistols-at-dawn duel? Joining forces to mock “Science Boy?” Re-enacting the final scene in Reservoir Dogs? They say a picture is word a thousand words, but they often don’t speak for themselves, no matter how much we want them to. We’ve reached out to both campaigns to find out what really went on during that commercial break, and are awaiting a response.